Title: The Point Of No Return? It is six months since Richey James, guitarist of the new-wave punk band Manic Street Preachers, abandoned his car near the Severn bridge. None of his family or friends has heard from him since. Some fear that he may have taken to heart the band's hit single Suicide Is Painless. Others hope he will still turn up. A note propped up on the rumpled bed said simply: "I love you." It was penned in the scrawling hand of rock hero Richey James before he slammed shut the door of room No 561 in London's Embassy Hotel, and on everyone in his life to date. Beside the message lay a parcel for the mystery girl he adored; a girl he may now never get round to telling his true feelings. Since that day there has been silence from the talented lyricist and guitarist of a new-wave punk band that was on the brink of conquering America and becoming one of the biggest in the world. The 28-year-old musician, who did so much to make the nihilistic, androgynous Manic Street Preachers the brand name of disenchanted British youth, walked from the London hotel out on to the February street, watched by a receptionist, and got into his silver Vauxhall Cavalier, then promptly disappeared. He left his possessions, apart from a current passport (he was due to start a promotional tour of America that day), in the abandoned room and, much to the distress of the other three band members, his fans and his family, never made contact with any of them again. 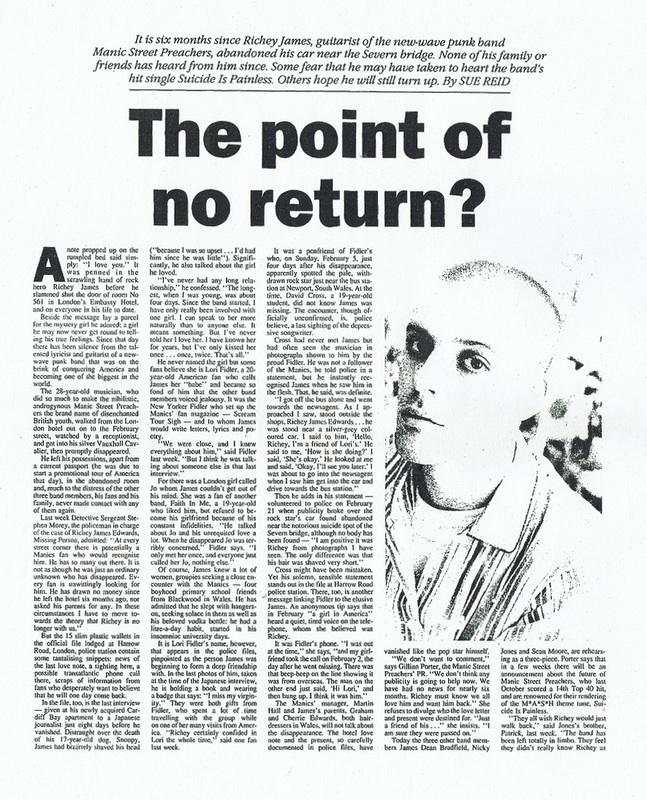 Last week Detective Sergeant Stephen Morey, the policeman in charge of the case of Richey James Edwards, Missing Person, admitted: "At every street corner there is potentially a Manics fan who would recognise him. He has so many out there. It is not as though he was just an ordinary unknown who has disappeared. Every fan is unwittingly looking for him. He has drawn no money since he left the hotel six months ago, nor asked his parents for any. In these circumstances I have to move towards the theory that Richey is no longer with us." The 15 slim plastic wallets in the official file lodged at Harrow Road, London, police station contain some tantalising snippets: news of the last love note, a sighting here, a possible transatlantic phone call there, scraps of information from fans who desperately want to believe that he will one day come back. In the file, too, is the last interview given at his newly acquired Cardiff Bay apartment to a Japanese journalist just eight days before he vanished. Distraught over the death of his 17-year-old dog, Snoopy, James had bizarrely shaved his head ("because I was so upset ... I'd had him since he was little"). Significantly, he also talked about the girl he loved. I've never had any long relationship," he confessed. "The longest, when I was young, was about four days. Since the band started, I have only really been involved with one girl. I can speak to her more naturally than to anyone else. It means something. But I've never told her I love her. I have known her for years, but I've only kissed her once ... once, twice. That's all." He never named the girl but some fans believe she is Lori Fidler, a 20-year-old American fan who calls James her "babe" and became so fond of him that the other band members voiced jealousy. It was the New Yorker Fidler who set up the Manics' fan magazine Scream Tour Sigh and to whom James would write letters, lyrics and poetry. We were close, and I knew everything about him," said Fidler last week. "But I think he was talking about someone else in that last interview." For there was a London girl called Jo whom James couldn't get out of his mind. She was a fan of another band, Faith In Me, a 19-year-old who liked him, but refused to become his girlfriend because of his constant infidelities. "He talked about Jo and his unrequited love a lot. When he disappeared Jo was terribly concerned," Fidler says. "I only met her once, and everyone just called her Jo, nothing else." Of course, James knew a lot of women, groupies seeking a close encounter with the Manics four boyhood primary school friends from Blackwood in Wales. He has admitted that he slept with hangers-on, seeking solace in them as well as his beloved vodka bottle: he had a litre-a-day habit, started in his insomniac university days. It is Lori Fidler's name, however, that appears in the police files, pinpointed as the person James was beginning to form a deep friendship with. In the last photos of him, taken at the time of the Japanese interview, he is holding a book and wearing a badge that says: "I miss my virginity." They were both gifts from Fidler, who spent a lot of time travelling with the group while on one of her many visits from America. "Richey certainly confided in Lori the whole time," said one fan last week. It was a penfriend of Fidler's who, on Sunday, February 5, just four days after his disappearance, apparently spotted the pale, withdrawn rock star just near the bus station at Newport, South Wales. At the time, David Cross, a 19-year-old student, did not know James was missing. The encounter, though officially unconfirmed, is, police believe, a last sighting of the depressive songwriter. Cross had never met James but had often seen the musician in photographs shown to him by the proud Fidler. He was not a follower of the Manics, he told police in a statement, but he instantly recognised James when he saw him in the flesh. That, he said, was definite. "I got off the bus alone and went towards the newsagent. As I approached I saw, stood outside the shops, Richey James Edwards ... he was stood near a silver-grey coloured car. I said to him, 'Hello, Richey, I'm a friend of Lori's.' He said to me, 'How is she doing?' I said, 'She's okay.' He looked at me and said, 'Okay, I'll see you later.' I was about to go into the newsagent when I saw him get into the car and drive towards the bus station." 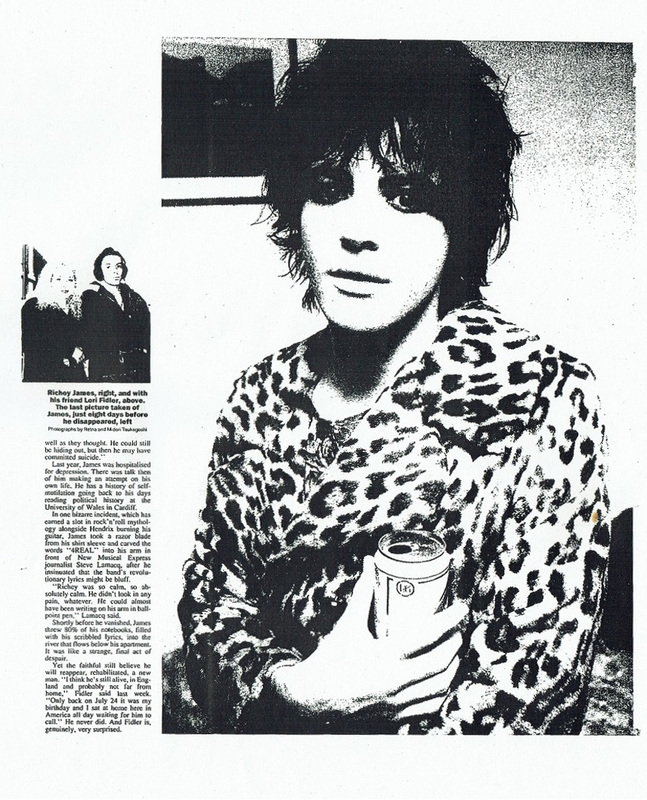 Then he adds in his statement volunteered to police on February 21 when publicity broke over the rock star's car found abandoned near the notorious suicide spot of the Severn bridge, although no body has been found "I am positive it was Richey from photographs I have seen. The only difference was that his hair was shaved very short." Cross might have been mistaken. Yet his solemn, sensible statement stands out in the file at Harrow Road police station. There, too, is another message linking Fidler to the elusive James. An anonymous tip says that in February "a girl in America" heard a quiet, tired voice on the telephone, whom she believed was Richey. It was Fidler's phone. "I was out at the time," she says, "and my girlfriend took the call on February 2, the day after he went missing. There was that beep-beep on the line showing it was from overseas. The man on the other end just said, 'Hi Lori,' and then hung up. I think it was him." The Manics' manager, Martin Hall and James's parents, Graham and Cherrie Edwards, both hairdressers in Wales, will not talk about the disappearance. The hotel love note and the present, so carefully documented in police files, have vanished like the pop star himself. "We don't want to comment," says Gillian Porter, the Manic Street Preachers' PR. "We don't think any publicity is going to help now. We have had no news for nearly six months. Richey must know we all love him and want him back." She refuses to divulge who the love letter and present were destined for. "Just a friend of his..." she insists. "I am sure they were passed on." Today the three other band members James Dean Bradfield, Nicky Jones and Sean Moore, are rehearsing as a three-piece. Porter says that in a few weeks there will be an announcement about the future of Manic Street Preachers, who last October scored a 14th Top 40 hit, and are renowned for their rendering of the MASH theme tune, Suicide Is Painless. "They all wish Richey would just walk back," said Jones's brother, Patrick, last week. "The band has been left totally in limbo. They feel they didn't really know Richey as well as they thought. He could still be hiding out, but then he may have committed suicide." Last year, James was hospitalised for depression. There was talk then of him making an attempt on his own life. He has a history of self-mutilation going back to his days reading political history at the University of Wales in Cardiff. In one bizarre incident, which has earned a slot in rock'n'roll mythology alongside Hendrix burning his guitar, James took a razor blade from his shirt sleeve and carved the words "4 REAL" into his arm in front of New Musical Express journalist Steve Lamacq, after he insinuated that the band's revolutionary lyrics might be bluff. "Richey was so calm, so absolutely calm. He didn't look in any pain, whatever. He could almost have been writing on his arm in ballpoint pen," Lamacq said. Shortly before he vanished, James threw 80% of his notebooks, filled with his scribbled lyrics, into the river that flows below his apartment. It was like a strange, final act of despair. Yet the faithful still believe he will reappear, rehabilitated, a new man. "I think he's still alive, in England and probably not far from home," Fidler said last week. "Only back on July 24 it was my birthday and I sat at home here in America all day waiting for him to call." He never did. And Fidler is, genuinely, very surprised. This page was last modified on 15 May 2018, at 09:53.